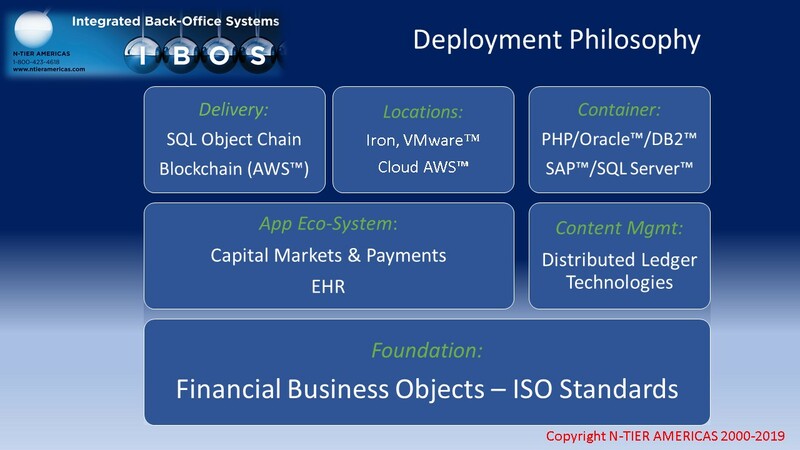 A core design feature of the IBOS is the use of N-Tier's unique SQL-Object-Chain™ Technology & Replication, both forerunners to today's Blockchain paradigm. ISO 17442:2012 - Financial services -- Legal Entity Identifier (LEI). The unique architecture of N-Tier's Technology facilitates back-dated trades, seamless workflow of transactions & integrated accounting, instantly and in real time. The design is unique and underpins the N-Tier Distributed Ledger Architecture (DLA). N-Tier's 20 years experience of Capital Markets Eco-Systems has enabled the company to embace and deploy practical solutions under the Blockchain paradigm including Global Depository Ledger and Global Accounting Ledger. Technology Architecture is constantly evolving. N-Tier Americas has adopted the company deployment model and reconfigured it to allow for newer platforms such as VMWare™, Amazon AWS™ Cloud while still supporting legacy Iron Servers. Datasets are now information ledgers that can be distributed utilizing the excellent Hyper-Ledger Fabric permissioned BlockChain databases. The N-Tier Deployment Model Schema is shown on the left. Prospective clients can customize their own variants depending on their firm's architecture and future platform objectives.